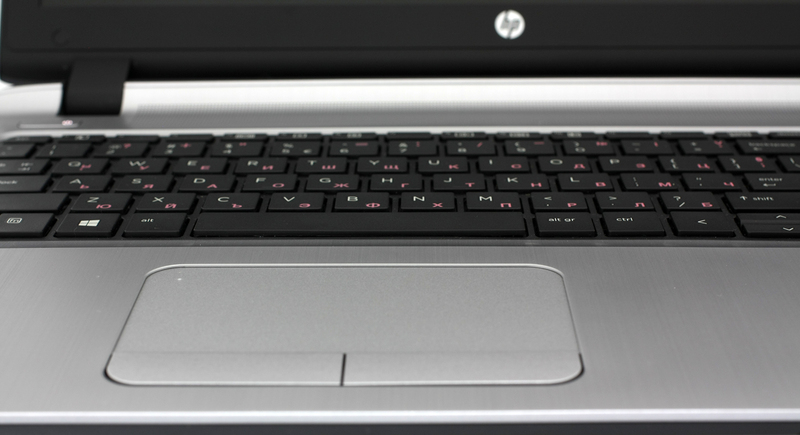 We really can’t get enough of those HP ProBooks. 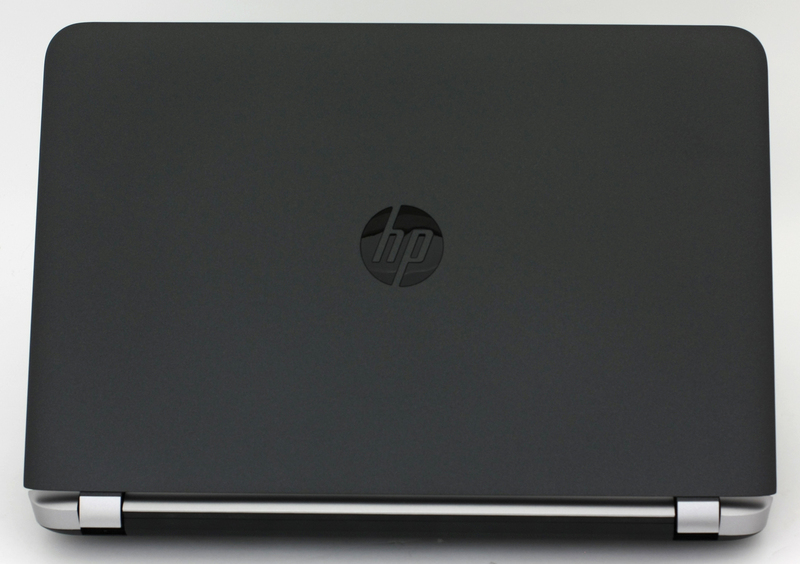 Even though the ProBook lineup isn’t representing the high-end segment of the market, HP’s budget business selection seems underrated as they offer somewhat superb working experience with elegant and robust chassis, excellent keyboard and touchpad, not to mention the provided M.2 SSD slot, which is quite a rare find at this price range. You might have already heard our opinion of the 14-inch version (440 G3) and it doesn’t differ too much for the 15-inch model as well. Anyway, here we are going to focus on the differences between the Intel-powered model (450 G3) and the AMD-powered one (455 G3). Both configurations feature discrete GPU, AMD Radeon R7 M340, so we don’t expect any gap between the two in terms of raw graphics performance. With the 450 G3 and 455 G3 having nearly the same asking price, we are curious to see how the Core i5-6200U will stack against the new AMD APU – A8-7410. There’s one important thing to note here, though. Most regions don’t offer the configuration we are currently reviewing, but instead, the notebooks rely on the integrated GPUs – Intel HD Graphics 520 in the Intel-powered configuration and Radeon R5 in AMD’s case. 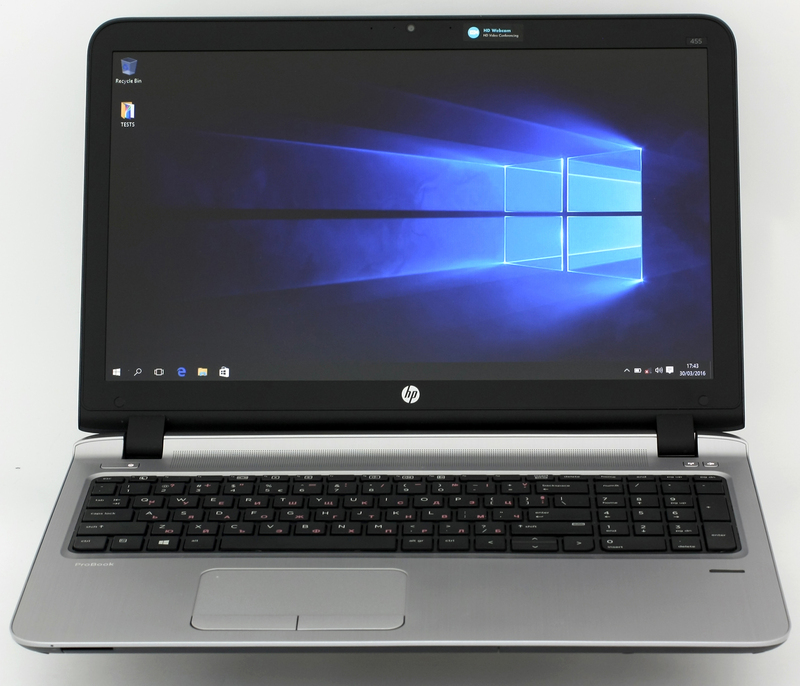 If you are interested in buying one of the aforementioned configurations, make sure to check out the HP ProBook 455 G3 here and the 450 G3 here. 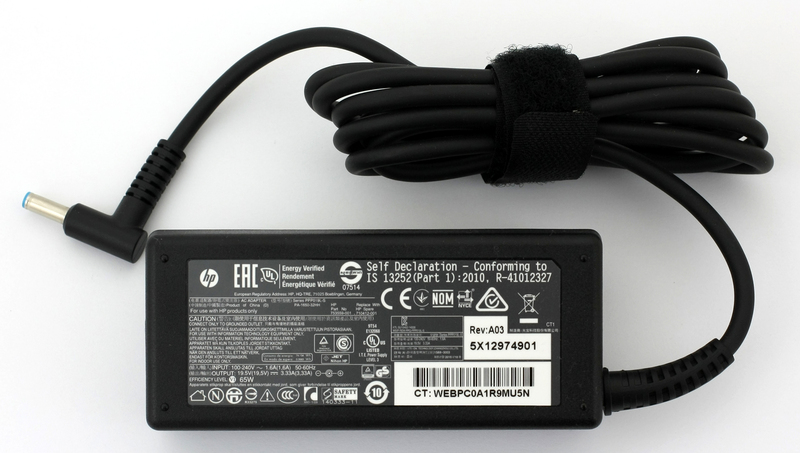 The notebook came in a standard packaging without any additional accessories, except for a DVD with drivers, AC adapter, cable and the device itself. 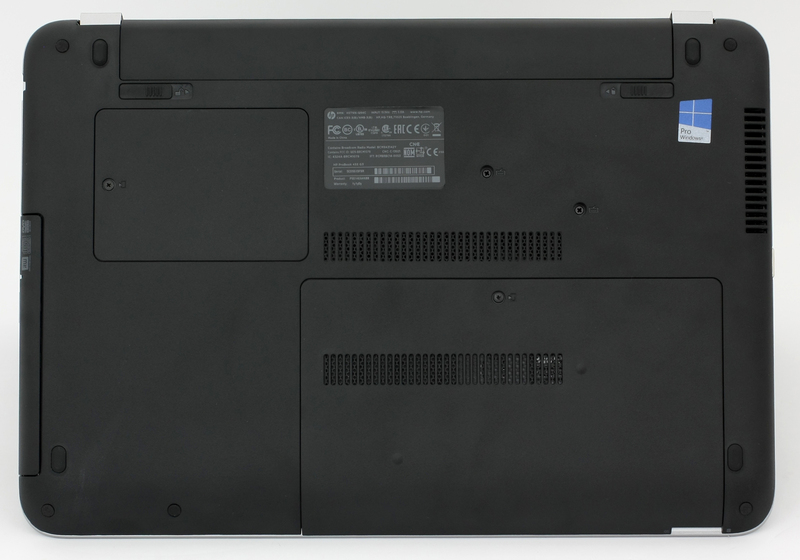 We will try to be brief here, as we already gave our opinion of the overall design and construction in ProBook 440 G3’s review. The 15-inch and 14-inch versions share absolutely the same design language and materials but, of course, the 15-incher weighs (2.217 kg) a bit more and it’s slightly bigger. The lid is covered in a black matte, slightly rubberized, plastic providing secure grip, nice feel, and relatively good sturdiness. Nonetheless, the panel sinks under pressure but nothing problematic. 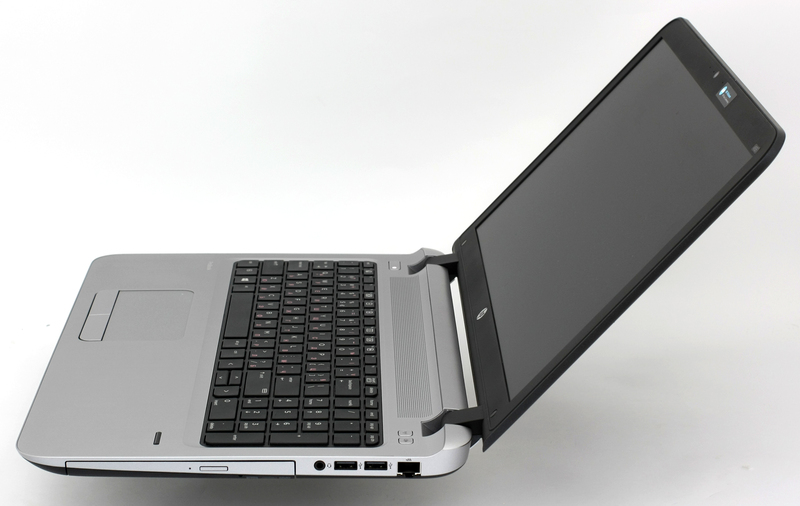 Hinges aren’t too tight so opening the laptop with one hand is possible but keeps the screen stable and firmly in position. The bottom piece adopts two service lids – one of the RAM chips and the other for managing the storage devices. There are also a few vent openings for extra airflow and the battery is user-replaceable. Luckily, the increase of height in the 455 G3 is quite unnoticeable with only a few millimeters – 24.8 mm vs 21.1 mm in favor of the 440 G3 (14-inch variant). The same goes for the port placement – the left side holds one HDMI port, a pair of USB 2.0 ports and a VGA connector right next to the main exhaust vent. 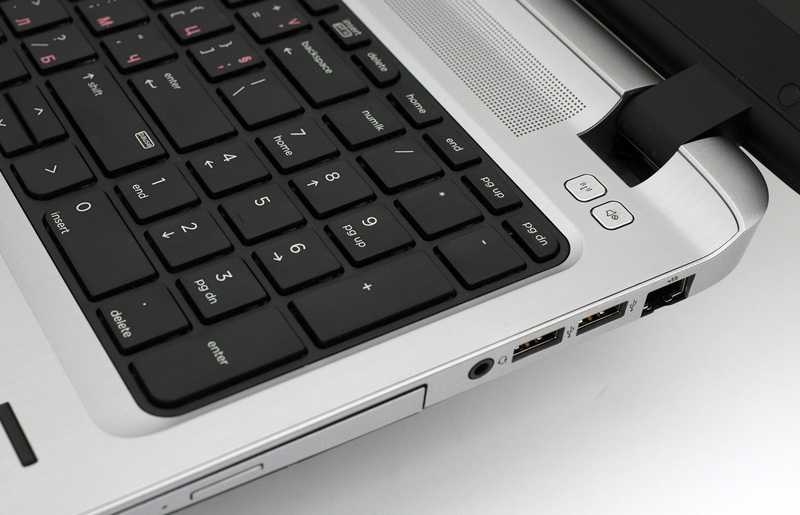 The right side adopts another set of two USB 3.0 ports, LAN and 3.5 mm jack. There’s also the optical drive if you still have the need for those. The sides are built from silver-colored plastic mimicking the brushed aluminum-finish in the interior. Speaking of which, it’s noticeably bigger than the one on the 14-inch version, giving more room for the wrist rest area as well as letting the keyboard stretch with a Numpad. Oh, and the keyboard is awesome as usual – long key travel, good spacing (maybe on the tight side, but easy to get used to) and excellent ergonomics. The same kind words apply to the touchpad, which is responsive, sometimes unwilling to register a two-finger swipe, but the mouse buttons are really comfortable to use. Of course, the best part in the interior is the brushed aluminum plate giving extraordinary sturdiness and a nice touch. It might be a bit hefty for some (2.270 kg), but at this price range, we can’t really complain. Also, the build quality is quite frankly unmatched for the asking price so now we only need to check a few more things – battery life, performance and cooling capabilities. 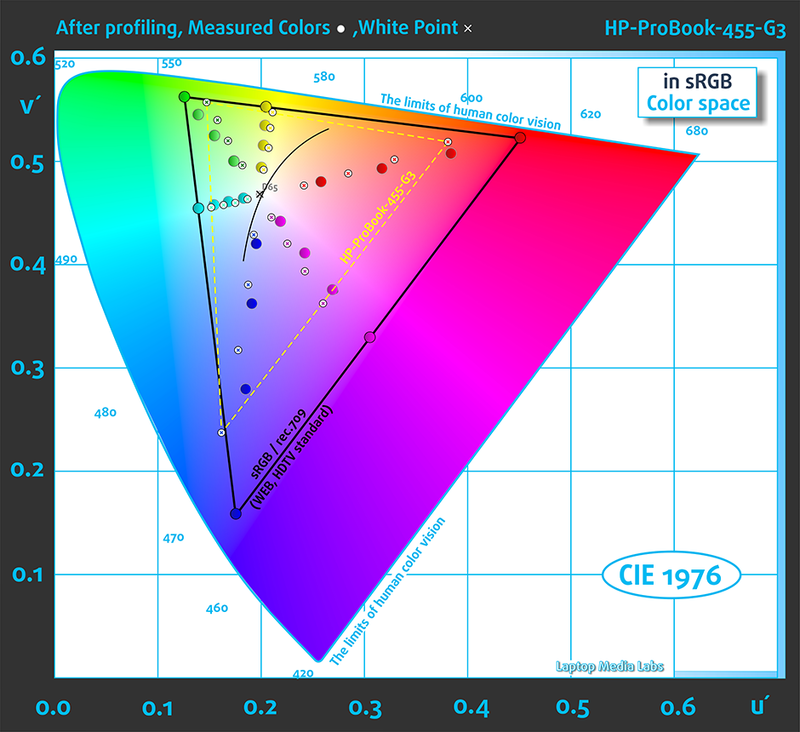 HP ProBook 450/455 G3’s display uses a TN panel with WXGA resolution (1366×768), or HD, in a 15.6-inch diagonal. This means 16:9 aspect ratio, 100 ppi pixel density and 0.253 x 0.253 pixel pitch. It can be considered as “Retina” when viewed from a distance equal or greater than 86 cm. Viewing angles are narrow due to the TN matrix. We were able to record 233 cd/m2 maximum brightness in the middle of the screen and 226 cd/m2 average. The maximum deviation is 12% in the upper-right corner. For white point, we’ve recorded 6910K in the middle of the screen and 6850K average color temperature while the maximum deviation is -3.6%. When it comes to color deviation, the maximum dE2000 is 2.9 and average is 1.7. Of course, the display covers just half of the sRGB gamut (53%) but it should be sufficient for office work and general browsing. The contrast ratio is pretty low – 250:1 – and it goes even lower after calibration – 220:1. Also, the gamma with stock settings will make up for brighter images. Unfortunately, the PWM is recorded throughout all brightness levels (except 100%, of course) but the emitted light pulsates at higher frequency (22 kHz) and can be considered less harmful than usual. The notebook’s display has understandably low specs and it should do fine for the usual office work and browsing. However, it cannot be overlooked the fact that it has relatively low contrast ratio and uses PWM from 0 to 99%. So it’s advisable that you use an external monitor most of the time, otherwise, the notebook is a solid performer and plenty of other features you should take advantage of. The stereo loudspeakers deliver good sound quality with little resonance at higher frequencies. Configurations may differ depending on your region. 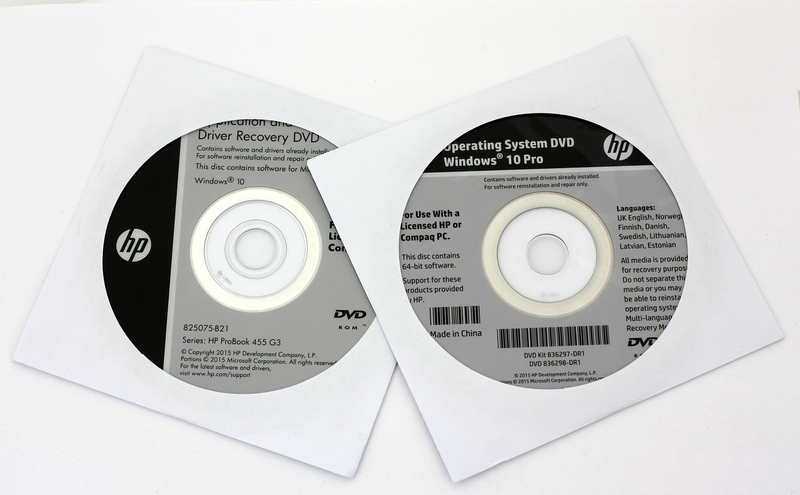 We used a fresh install of Windows 10 (64-bit) for the testing of both devices and if you wish, you can find all the needed drivers from HP’s official support page. 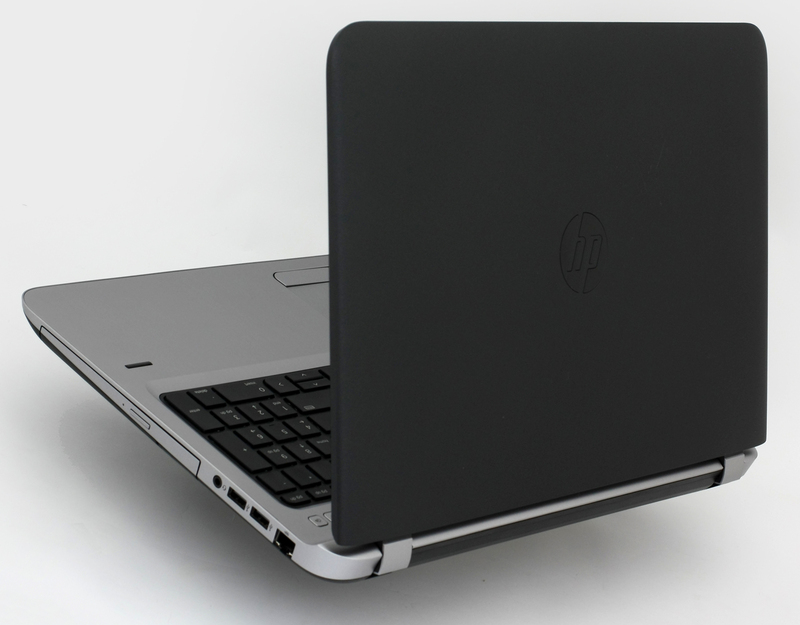 For HP ProBook 450 G3 drivers, click here. 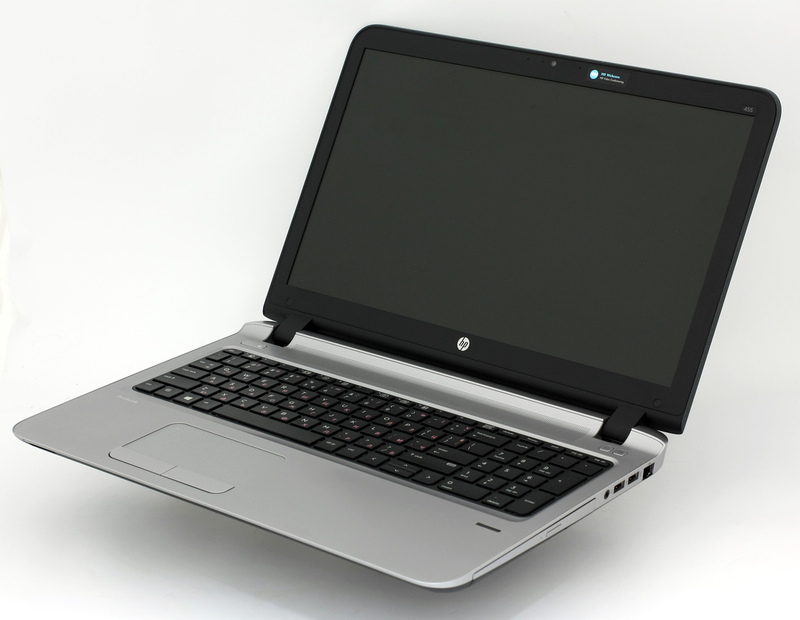 For HP ProBook 455 G3 drivers, click here. And here’s the first surprise. As you may have guessed, the Intel variant offers more raw performance and holds an edge over AMD’s solution, but if you are aiming for overall better battery life, you might want to go for the AMD A8-7410 variant. The 455 G3 offers around 25% better browsing runtimes compared to the Intel Core i5-6200U version while using the same battery capacity, display, discrete GPU etc. But the video playback result wasn’t as convincing and still a bit better than Intel’s version. And as always, all tests were performed using the following settings: Wi-Fi turned on, battery saver switched on and screen brightness set to 120 cd/m2. Excellent readings for the 455 G3 – 500 minutes (8 hours and 20 minutes). Negligible difference here – 379 minutes (6 hours and 19 minutes) for the 450 G3 and 375 minutes (6 hours and 15 minutes) for the 455 G3. When it comes to gaming, both laptops scored nearly identical results as well – 175 minutes for the 455 G3 and 173 minutes for the 450 G3. The AMD A8-7410 is based on Puma+ architecture and represents the Carrizo-L CPU lineup, which stands for entry-level devices and subnotebooks. The chip offers four compute cores clocked at up to 2.5 GHz and having a base clock of 2.2 GHz. It’s built around 28nm manufacturing process with configurable TDP of the whole SoC. It can go as low as 12W or as high as 25W and this includes the single-channel DDR3L-1866 memory controller and the integrated graphics chip – Radeon R5. Speaking of which, it has 128 shaders running at a maximum of 850 MHz. The most impressive feature of the Radeon R5 is the ability to decode videos up to 4K resolution using the UVD (Unified Video Decoder). The chip also uses the specialized video encoder called VCE. The Radeon R5 can support up to two displays at once using either VGA, DVI, HDMI 1.4a and DisplayPort 1.2. Fritz is a chess benchmark which tests the computing capabilities of the CPU with various chess moves. 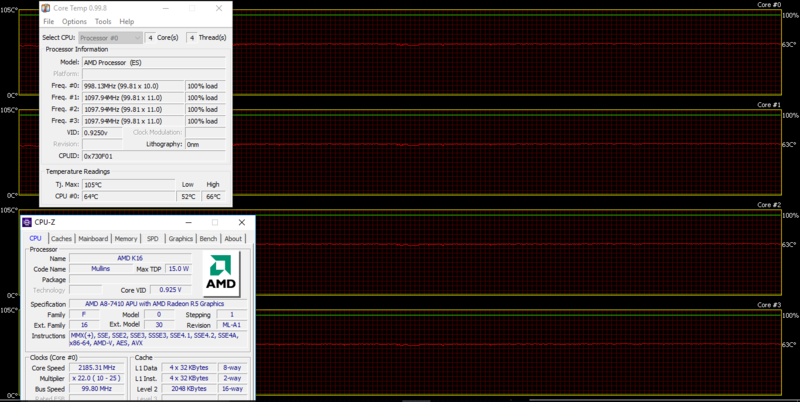 The Intel Core i5-6200U managed to get 5.477 million moves per second while the AMD A8 7410 scored 4.483 million. For comparison, one of the most powerful PCs, Deep(er) Blue, was able to squeeze out 200 million moves per second. In 1997 Deep(er) Blue even beat the famous Garry Kasparov with 3.5 to 2.5. 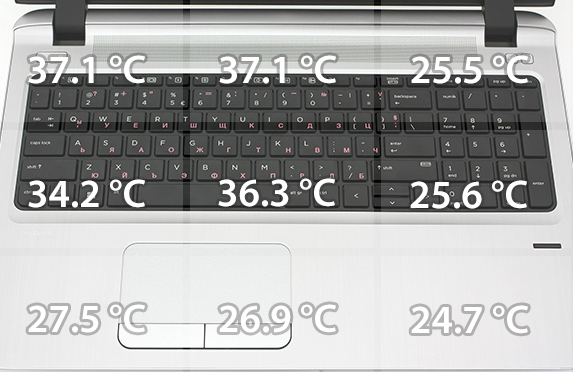 This test doesn’t actually represent real-life usage but it’s a good way to assess the overall performance of the cooling system and the stability of the laptop in the long run. We use 100% CPU load + 100% GPU load to see how the machine handles high workload for extended periods of time. 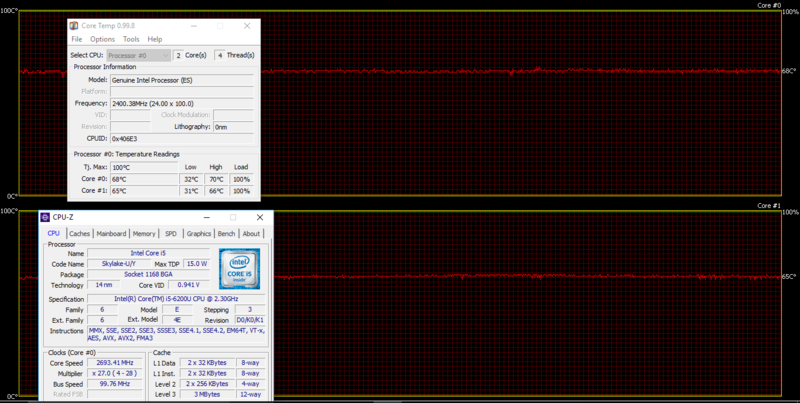 We started off with the CPU torture test and found out that both machines, with both chips, handle the pressure pretty well while keeping the maximum operating frequencies stable without signs of thermal throttling. 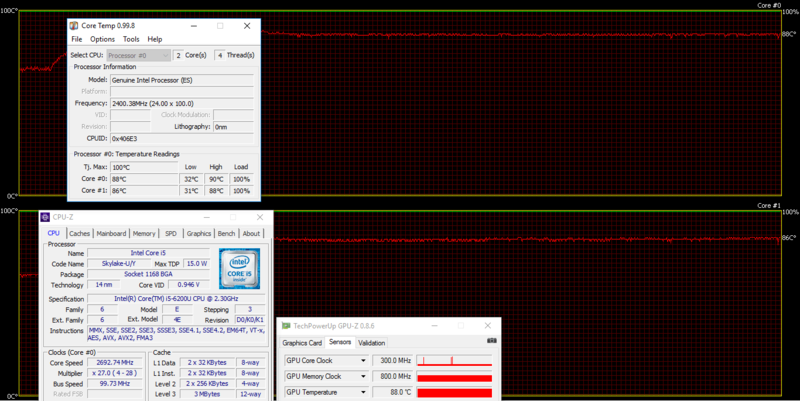 The maximum operating temperature for the AMD chip was around 66 °C while Intel’s chip maintained around 66 °C. Up until now, there were no significant differences between the 455 G3 and 450 G3, but after we turned on the GPU stress test, things started to look different. Surprisingly, the AMD model handled both workloads, of the CPU and GPU, with ease while maintaining relatively low temperatures without signs of thermal throttling but the same cannot be said for the Intel variant. 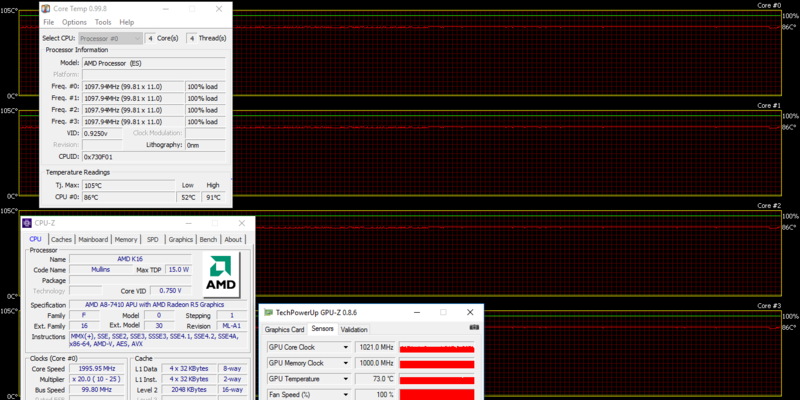 The GPU stress test took a toll on the system and the graphics chip started throttling at 88 °C (for the record, AMD’s variant kept the GPU at 73 °C). And while the notebook isn’t intended for such heavy workloads for long periods of time, it’s important to note that the AMD-powered model handles the heat better. Maybe this was kind of expected given the bigger “horsepower” the Core i5 CPU has to offer. Anyway, temperatures on the surface remained roughly the same in both variants with no signs of overheating. 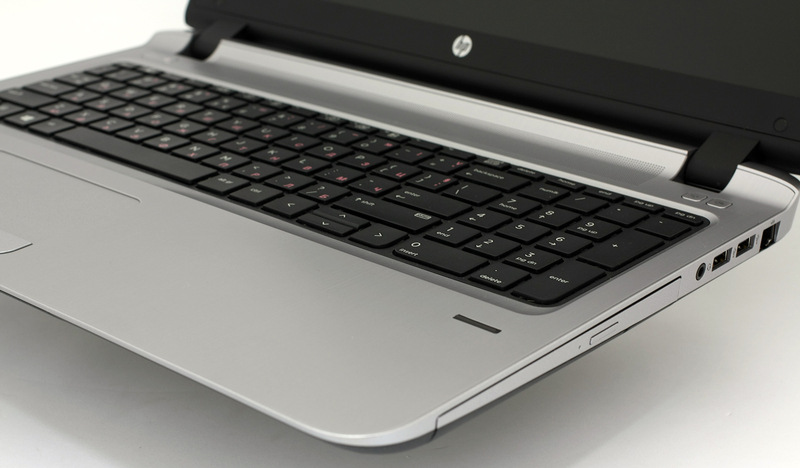 Quite frankly, we weren’t surprised by the ProBook at all since the review of the 14-inch model. Our opinion of the product remains unchanged and it’s mostly positive. We are happy with the build quality, the good choice of materials and overall design. All of this make up for a reliable, sturdy and elegant product which is rarely found in this price range. 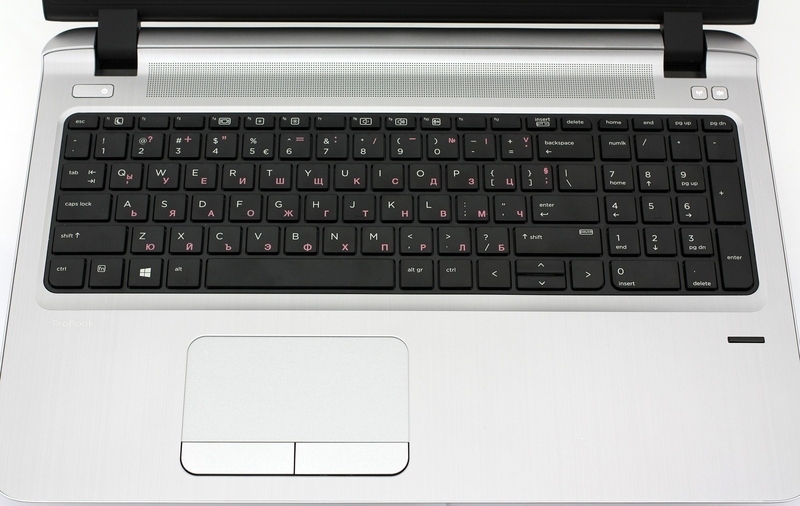 The chassis also holds four USB ports on top of all other standard connectivity options and, of course, doesn’t lack the much needed good typing experience offering excellent keyboard and touchpad usability. On the hardware front, the 15-inch ProBook is offered in two variants – with Intel CPU and AMD chip and we were able to test out just the Core i5-6200U and the AMD A8-7410 configurations and since they cost just about the same, we thought a good comparison will help users decide whether to stick with the Intel-powered model or try out the new AMD chip. It turns out that if you need more raw power, the Intel Core i5-6200U delivers considerably higher performance than its AMD counterpart, but if battery life is what you seek, the 455 G3 holds an edge over the Core i5 with around 25% better browsing runtimes. Stil, both machines will do just fine away from the power grid. Otherwise, there’s no significant difference in heat management and other hardware in both models – even the displays are the same. Speaking of which, the ProBook has an energy-efficient TN panel suitable for office work and browsing but the lack of sRGB gamut and low contrast ratio make it somehow inappropriate for multimedia purposes. But this is expected with a business-oriented notebook but we still suggest using an external monitor most of the times when working for longer hours due to the detected PWm from 0 to 99% screen brightness. However, the frequency of the pulsations are pretty high and will most likely affect only users with sensitive eyes. All and all, the HP ProBook 455/450 G3 is a great all-rounder with tons of useful features no matter with which model you choose to go with. Does the low contrast have a Terrible effect when watching movies or playing games? I want to buy acer 574 tn panel core i3 hd version or pro book 450 g3. I’m looking to buy the version with i7-6500U but I can find it only with the DDR3L. Can I replace it with DDR4 after purchase? No, the motherboard doesn’t support DDR4 RAM. And besides, you won’t notice the difference in real-life use. If I read the specs right, I can purchase the SSD based model for overall speed and add a 1 TB SATA HDD afterwards to increase capacity? It strongly depends on your region and retailer. They might sell units with only M.2 or only HDD or both. Also, can you get it with Windows 7, not that bloated pigware Win10? It means that during heavy load for longer periods, the system can’t utilize the full performance of the CPU and underclocks it below the given base clocks. 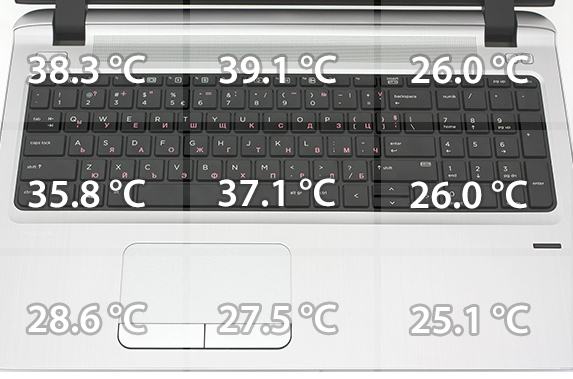 However, this shouldn’t be an issue for most users as I stated in the temperatures section. How noisy is the system idle and under load? is the fan loud? Is it possible to upgrade the graphics card to 4GB Nvidia graphics card? If yes is there any negative effects to doing so?